I have been listening to the music of Lenka Lichtenberg for some time now. Still, it never fails to amaze me that I find myself catching my breath every time I put on a recording of hers into the CD player a second and third time, or even many more times than that. The poignant nature of her music is affecting. It touches me because I am transported to Israel, to my family and their lives there; to my beloved aunt and uncle who are buried there and to the entire Diaspora scattered all over the world after more than 5000 years and a home of their own through much trial and tribulation. This time Ms. Lichtenberg’s and Yair Dalal’s recording strikes my heart like an arrow piercing its centre. 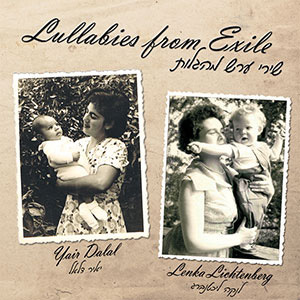 It is called Lullabies from Exile. The credits, shared by Ms. Lichtenberg and Mr. Dalal mean the songs have been written by both of them. But in the end it matters not who has written and what; and that the music is sung in Czech and Yiddish, and in Judeo-Arabic, the music is outstanding and hair-raising whether the words are fully comprehended or not. 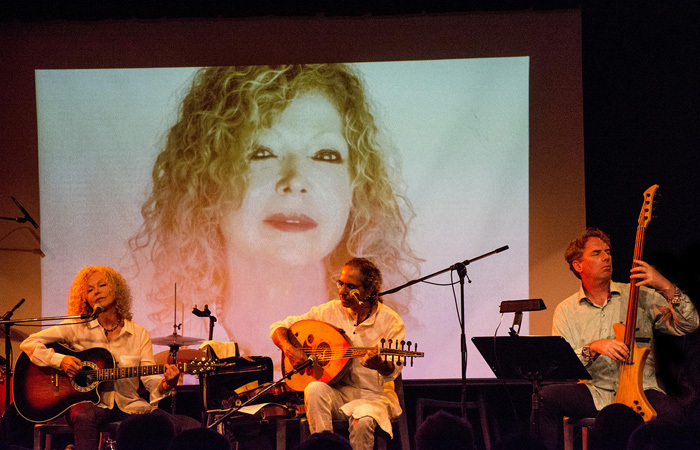 This is because the songs are lyrical, dramatic and worked by Ms. Lichtenberg and Mr. Dalal with extraordinary heartache that they are passionately received by an audience—for we are at the launch of the CD, at the 2014 Ashkenaz Festival in Toronto—that comprises that is wide-ranging in age. Memories are long here and both young and old recall some of the music that must surely have been sung to them at some point in their lives. I know for sure that my aunt sang it to me when I was little. The concept of the album is to blend the Eastern European/Ashkenazy and the Middle Eastern (Sephardic) musics together and the recording does this in a superb, seamless manner while also revealing the known and the unknown and the fastidious nature of the performances underline the artistry of both Ms. Lichtenberg and Yair Dalal. It also bears mention here that the quartet of clarinet, accordion, bass and percussion that back the stars up on the live performance, and musicians who do so on the recording are outstanding. The plan is simple yet classic here: to take songs from various eras and pair them up with contemporary musical treatment. In the nature of things, these are often variation sets such as the vigorous goings-over of the Czech and Yiddish versions and the more echoing and haunting versions of the music in Judeo-Arabic. They are great lullabies, of course, and in truth the musical strength and interest comes more from that than the quality of the variations, but the full-toned virtuosity of the singers and the accompanying instrumentalists—at performance and on record—especially in the melancholia and haunting clarinet and the gently stuttering percussion make for an entertaining and affecting programme. The songs, sung in their original languages sound authentic and the performances everywhere are secure and intelligent, with a beguiling soft flutter. No words might be enough to praise Lenka Lichtenberg’s vocalastics nor Yair Dalal’s, who also is an exquisite performer on violin and oud as well. The photographs projected on the screen as a backdrop extend the stunningly evocative vignettes for the all too memorable performance.